OnePlus Power Bank - Review & Giveaway of a well designed performer. In the current world where the feature phones have almost become extinct and most of us carry smartphones and in that, most of us are hooked onto the net non-stop. And with phones becoming more and more affordable and loaded with good cameras clicking pictures is one of the main purposes. Now all of this comes with a catch – the battery running out of juice. It is hard to keep hooked into a wall every now and then and hence most of the OEMs are now coming up with tiny juice boxes called powerbanks that come in many different capacities. While most of the companies just dump in the batteries into a box, there is one company which has been very unique right from the way they package their products to building some stunning designs in whatever they produce. We are talking of none other than OnePlus. We have seen how well they package their phones and now with the power bank being released in India one gets to experience their other products as well. 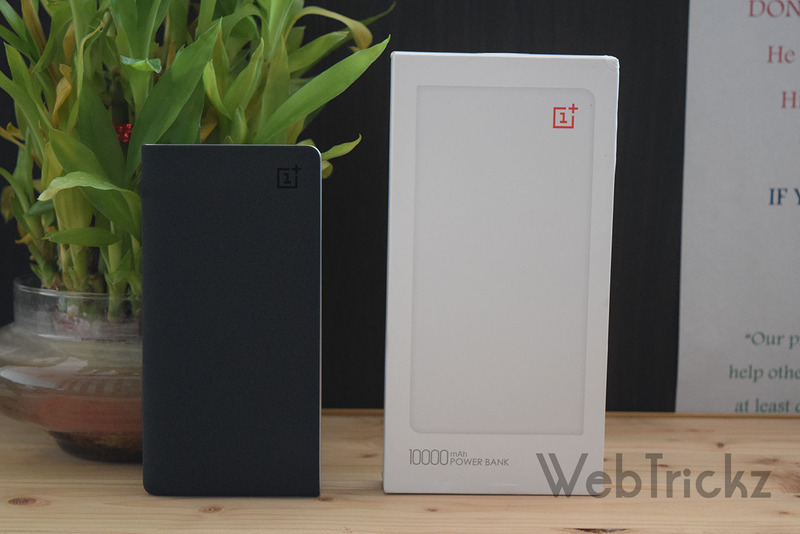 Lets look at the various aspects of the OnePlus power bank. Just one word – Art! yes, we are not exaggerating but this power bank is a piece of art. While other players like Xiaomi have just dumped cells into a box and then created shiny exteriors and giving it many different colors, OnePlus has spent a lot of time in truly designing a piece of marvelous art. When the OnePlus One was out, people were in for a pleasant suprise as the phone came in two options – Sandstone black and Silky White back options. These two were so unique that everyone who got the phone loved it. So much so that case manufacturers like Pelosi made sandstone cases themselves! 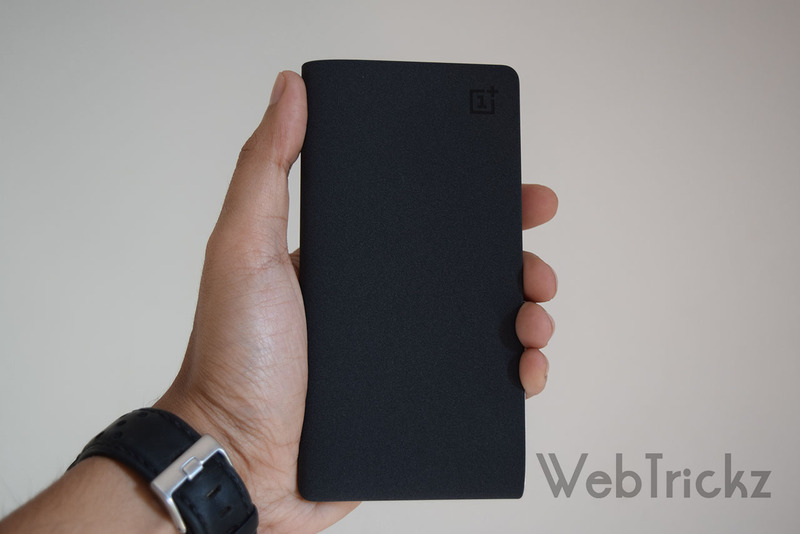 Leveraging on the success there, OnePlus has extended the sandstone black and silky white surfaces to its power bank. The overall design of the powerbank is so good that it literally feels like you’re holding a wallet. The form factor starts with parallel lines on one end that meet at the other end as they pass thru the curves. 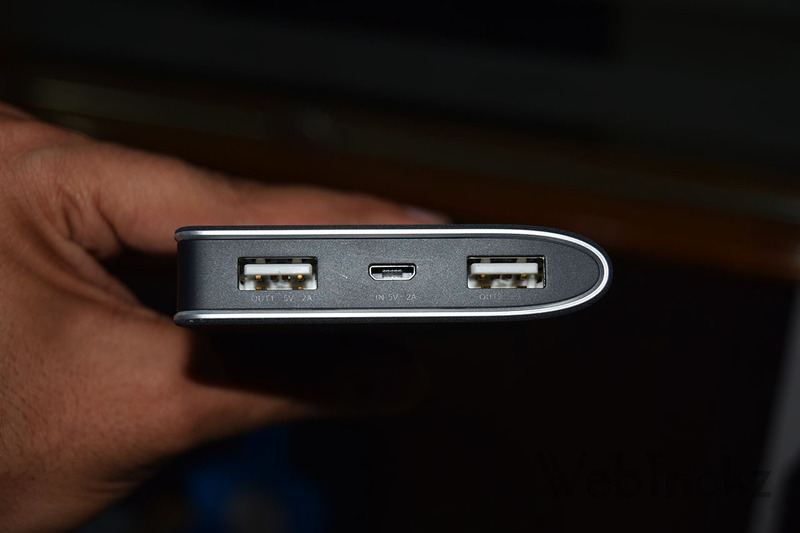 At the right hand top sits the OnePlus logo and on the top side you’d find two USB ports and a charging slot. Onto the right side edge there are 4 blue LEDs that light up and crawl as they charge or discharge and indicate that they are active. What we loved is the “Shake” to wake! Shake the power bank and the LEDs come up for a brief moment to let you know how much juice they have – cool ain’t it? We loved it. Coming at dimensions of 142.8×72.6mm, its a tall tall fella. But thanks to the overall design holding it is simply no problem. And compared to the bricky Xiaomi Power Bank this is a tad lighter. Of course the Xiaomi power bank holds 400mAh more worth of juice. So the closest it came to was charging 2.45s of OnePlus One which is not bad at all! Heating up – though OnePlus claimed that the power bank will NOT overheat we did observe that the temperatures shot upwards of 50 degrees C while it was being charged and upwards of 45 degrees C when it was connected to a device for discharging. Well, this was expected as most of the power banks do get heated up with so much of power being packed into them. One has to be really cautious NOT to place the power bank in the pocket while it is connected to a device for charging. Tell us why you’d love to have a OnePlus power bank or why we should give you one – Comment below or reply to this tweet with your answers. Update: Giveaway closed! The 2 lucky winners are Kartik Bansal and Nathaniel. Thanks everyone for their participation. P.S. This giveaway is NOT sponsored by OnePlus. The contest is only applicable for residents of India. I Wil love to own a power back as I don\’t need to worry about charging my device at any place and not worrying about my phone battery. 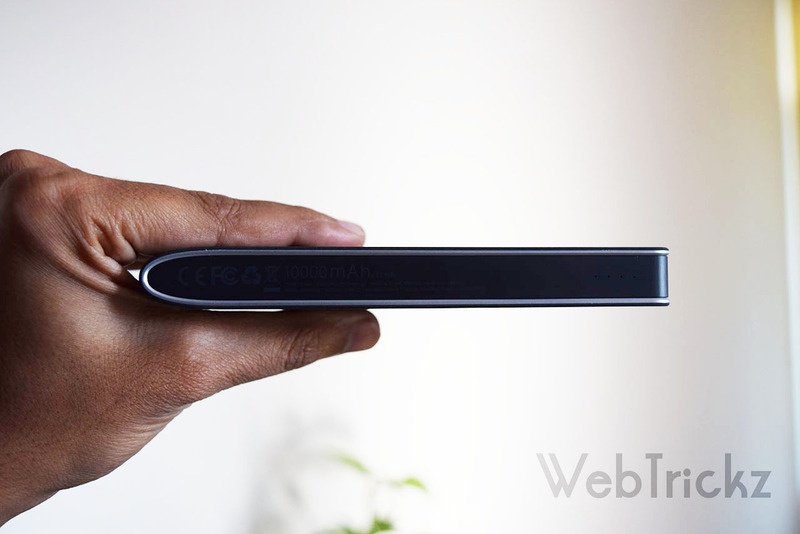 Secondly the OnePlus PowerBank is very compact and well crafted that it looks so beautiful. Nothing is more important than a smarthphone in case of emergency, A portable charger really helps a lot in that case. One plus one power bank looks very designer and moreover it has two USB slots. Having 10000mah juice will last long for at least 4 times for a smartphone. 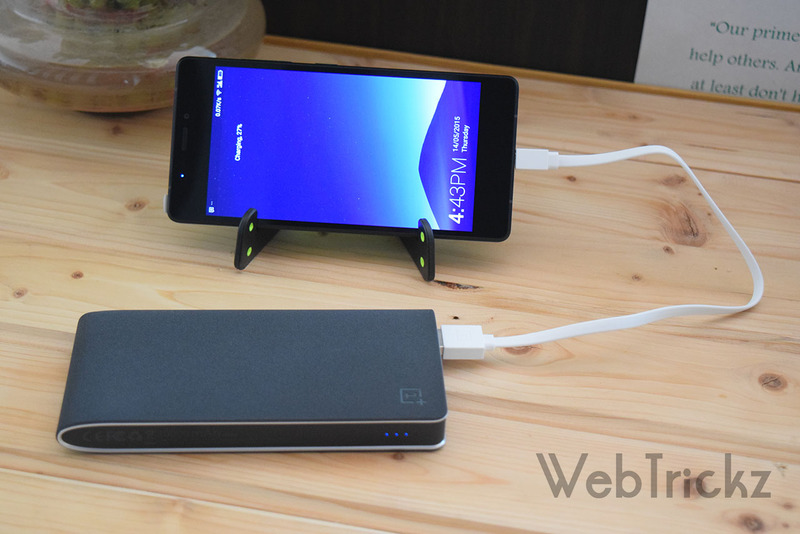 I would love to have a OnePlus power bank because it\’s the best powerbank available in India. As others I too have reasons to love OnePlus power bank. But the thing is I need it this time .. Had won 2 Mobile devices recently .. Aab baas Power Bank with two outputs ki kaami hai . The one plus power bank would best compliment my one plus phone. Would love to have a power bank that is designed so meticulously. Feel of sandstone variant in hand offers a unique experience. And I have a android phone which doesn\’t even last for a day ???? @web_trickz A Product is not just a product but a passion from the seller as well as the buyer. A great product is not just owned but cherished and loved. This is a unique power bank and the design is stunning. Going by your recommendation I would surely want to try and would highly appreciate it if am chosen in the giveaway. I shall also use it and report back with my own review to you ! As you rightly said, it is definitely An Art on Design & Apt on Technology. When Art meets Technology & #Webtrickz does such a wonderful review on that piece, it always gets more & more desirable. Oneplus Powerbank is one of the best powerbank in market right now. A package of great design, performance and less charging time can\’t be easily found. For student like me who travels 90 KM per day, Oneplus will be life-saving. One Plus One Powerbank is the Most Stylish , Lite weighted , Usefull & Reliable. Wish to Have one. I\’ve been searching online for a solid power bank from a reputed brand. I came across a Xiaomi 10400 mAh @ 400 on eBay. But that was an OEM version. I consulted @deal_bee and they told not to go for it & I won\’t get even ¼th efficiency as the original. So I skipped it and I\’m really in need for a Power Bank and I can\’t afford a higher price as I\’m just a student. This is a golden opportunity you are granting for me. P.S – I\’ve already replied to your tweet (@naif46). But I couldn\’t express the whole thing in 140 characters. So I thought I\’d comment here and disclose the same. I’ve been searching online for a solid power bank from a reputed brand. I came across a Xiaomi 10400 mAh @ 400 on eBay. But that was an OEM version. I consulted @deal_bee and they told not to go for it & I won’t get even ¼th efficiency as the original. So I skipped it and I’m really in need for a Power Bank and I can’t afford a higher price as I’m just a student. This is a golden opportunity you are granting for me. P.S – I’ve already replied to your tweet (@naif46). But I couldn’t express the whole thing in 140 characters. So I thought I’d comment here and disclose the same. Would like to have one so that wherever I go, I am not powerless! 10k capacity, curved design, dual 2A points, and the pouch.. Calling it a power bank is underestimation its a power tank thus I need some roaming artillery for my smartphone. Thanks for the giveaway. I don\’t have a powerbank, so it will be great if I win this here. I can then utilize the money for my study & books. I’d love to have a OnePlus power bank as its Fast charging as compared to other power banks of same capacity. Thanks for this Incredible Giveaway ! First thing I never owned any power bank and I\’m ambitious of photography. I love snapping picture all the time with my smartphone, so for this semester holidays I planned to improve my photography skills by visiting some new place and learning some tutorials via YouTube.so If you give me this power bank it would be very helpful for me in many ways. I would like to win the new OnePlus Power Bank, so that wherever I go, my OnePlus One is not powerless! One of the good looking powerbanks. So bored of carrying my MI powerbank now. This will be a welcome change. Hence, would love to own 1. If chosen, i\’ll try to promote your blog as much as possible. 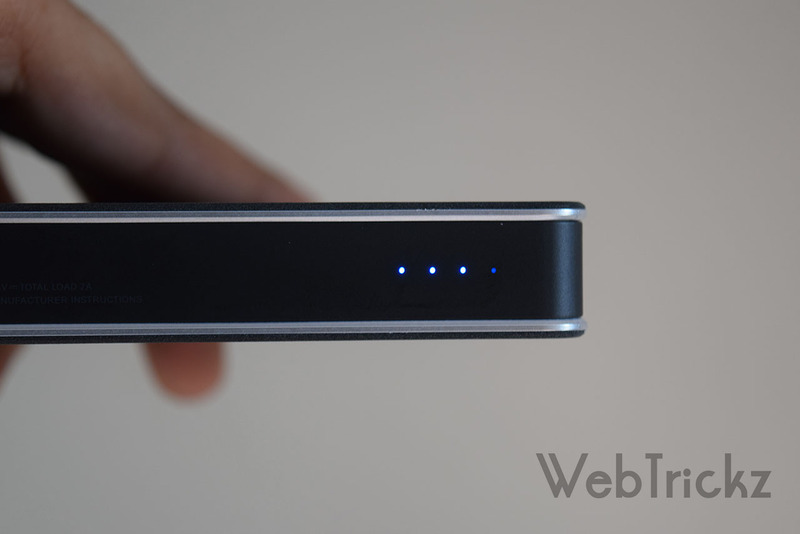 Maybe you can send me a Webtrickz sticker that i\’ll stick on the powerbank so as to promote your blog more. I wish to win the OnePlus power bank because I travel a lot and with that 10,000 mAh capacity I can charge my phone for a lavish one day or two without fearing about anything.